It’s one thing to rattle off “Show me the money,” another to come up with “She tried to sit in my lap while I was standing up.” Hollywood prides itself on memorable phrases, but many of the finest—along with their contexts—have been forgotten. This deck of Knowledge Cards revives forty-eight priceless moments (each from a different motion picture) between 1932 and the present when screenwriter, director, and actor collaborated on a perfect line. 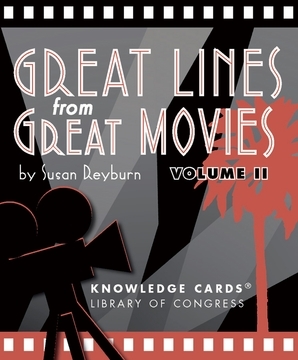 Each card contains a memorable line with related information that tells you who said what to whom, and in what film the phrase was featured. The cards can be read just for pleasure, or they can form the basis for a game that tests players’ knowledge of historic films. Movies named to the National Film Registry of the Library of Congress, which recognizes significant works in American culture, are distinguished by an asterisk.